Francesco Durante's father was employed by the S. Onofrio conservatory, so Francesco came to his musical training at the same institution quite naturally. He then studied in Rome but returned to Naples to lead the S. Onofrio conservatory. By 1728 he was the head of another conservatory in Naples, the Conservatorio dei Poveri di Gesù Cristo. He served there for 10 years, resigned and then headed the Conservatorio di S. Maria di Loreto. (All of these various conservatories were fused into a single institution by the French when Murat ruled Naples in the early 1800s.) Durante was primarily known as a composer of sacred music and was at mid-century the most respected teacher of music in Naples. Pergolesi and Paisiello were among his illustrious students. Leonardo Vinci. Anyone named Leonardo Vinci must have needed a real sense of humor. Presumably, this brought young Leo into the then new discipline of the Neapolitan Comic Opera after an education at the Conservatorio dei Poveri di Gesù Cristo. His first work was a comic opera called Lo cecato fauzo (fauzo is Neapolitan for "false" —here it is good to remember that most of these delightful works were, in fact, written in Neapolitan and not in Italian). The Blind Faker might be an appropriate translation, but I have never seen an English translation. It opened at the Teatro dei Fiorentini in Naples in 1719. Leonardo Leo was a student at the one Neapolitan conservatory not yet mentioned in this entry, the Conservatorio S. Maria della Pietà dei Turchini and the only one that still survives as a functioning church. He was a successful composer and church organist by his early 20s and then turned to writing comic opera, as well. When A. Scarlatti died in 1725, Leo replaced him as the first organist of the viceregal chapel. He composed serious works for theaters in Italy as well as for the court of Spain. In Naples, in 1739, he became the head of the conservatory where he, himself, had studied. He is remembered as a teacher and an innovator, concerning himself with reforming church music as well as the orchestra of the royal opera. Niccolò Jommelli. Mozart (in a letter in June, 1770, from Naples to his sister back in Austria) remarked that the opera (which he does not name) he had just heard by Jommelli was "beautiful but too old-fashioned." Well, that may have been the opinion of Young Master Wunderkind, but, nevertheless, Jommelli is one of three musicians whose names are inscribed on the facade of the San Carlo Theater in Naples (the other two are Pergolesi and Piccinni). They are all of the generation just before Paisiello and Cimarosa (and Mozart) and represent the best of opera, both opera seria and opera buffa, that the Kingdom of Naples had to offer in the middle of the 18th century, when the inscription was put in place. Jommelli was born in Aversa near Naples. He studied music in Naples at the Conservatorio de' poveri di Gesu' Cristo and then at the Conservatorio della pietà dei Turchini. His first opera, L'errore amoroso was successfully produced in Naples in 1737 and he swiftly became known throughout Italy and abroad. 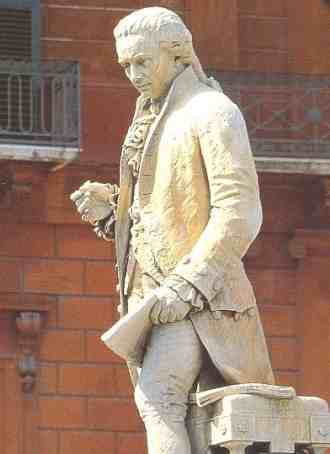 He worked in Venice, Rome and in Germany, returning to Naples in 1768. Besides all forms of opera, he wrote significant sacred music. His music is marked by innovations in harmony and, particularly, by—for the time—a very modern use of orchestral resources, particularly wind instruments. He used a larger orchestra than was customary and, indeed, helped put the orchestra in opera on an equal footing with singers He was one of the collaborators of the great librettist, Metastasio, who praised Jommelli for his ability to "seize the heart of the listener." Jommelli was at the height of his fame in the early 1750s, about 20 years before Mozart heard whatever opera it was that he was being snotty about. (Mozart was still a teenager. Everything sounds "old-fashioned" when you're 14! If Wolfgang had spent less time at the opera and more time out on the streets stealing whatever passed for hubcaps in 1770, he might have been less of a young fuddy-duddy.) When Jommelli died, he was universally proclaimed as one of the great composers of his day. Niccolò Piccinni. Somewhere, Mozart is supposed to have remarked that he wanted to compose comic opera as good as that of Piccinni. 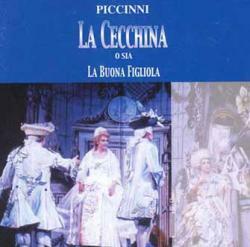 Indeed, between 1760 —the year of Piccinni's first great success, the comic opera, La Cecchina ossia La buona figliola (Cecchina or the Good Daughter, top photo)— and the coming of the generation of composers such as Cimarosa in the 1780s, no Italian composer was held in higher esteem throughout Europe than Piccinni. La Cecchina was the most popular work of its kind for years in Italy. The libretto is by Goldoni and is an adaptation of Pamela, or Virtue Rewarded by Samuel Richardson. Verdi, himself, said that La Cecchina was "the first true comic opera". The work belongs to the larmoyant school ("tear-jerker") popular in the mid-1700s (and ever since?) and features a young, delicate, orphaned heroine against the fates. Musically, Verdi held it in such high esteem because it was more than just a rollicking thigh-slapper; it showed Piccinni's flair for the minor, plaintive song, set uncharacteristically in a comic piece, not unlike, say, Donizetti's later "Una furtiva lacrima" in L'elisir d'amore. There is even a virtuoso bit of angry soprano, a stylistic precursor, some say, to Mozart's "Queen of the Night" in The Magic Flute. Piccinni was a prolific composer of symphonies, sacred music, chamber music, and opera (some estimates claim he wrote as many as 300 operas). His was prolific in biology, as well; he had seven children and was so concerned for their welfare and security that he accepted a well–paying appointment at the court of France in 1776. He represented one–half of the debate raging in Paris between the Italian style of music and the influential school of Gluck. Thus, it was the "Piccinnists" versus the "Gluckists," although Piccinni and Gluck, themselves, apparently never encouraged feuding between their respective claques. Piccinni returned to Naples in 1791 when the drivers of the French Revolution cut off his stipend. In Naples, he was thought to harbor revolutionary badthink and was placed under house arrest for four years. At the end of his life, he returned to France, where he died in 1800. The music conservatory in Bari, Italy, his birthplace, is named for him.